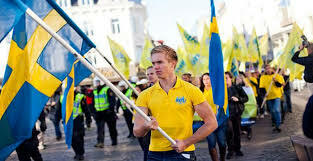 Despite remaining relatively monocultural during the twentieth century, Sweden’s fake left leaders opened the migrant floodgates at the start of the twenty first century. By 2009, immigration reached its highest level since records began with 102, 28o migrants, mainly from the Third World, making their home in Sweden. By 2015, those already record number of migrants were smashed, with 162,877 applying for ‘asylum’, predominantly Muslim, during that year alone. Now, thanks to that migrant influx, riots and large scale disturbances are a regular occurrence in Swedish towns and cities with a significant number of migrant newcomers. While sexual assaults against women have also skyrocketed, including sexual assaults by migrant gangs against young Swedish girls, some of which were scandalously covered up by the authorities and liberal media. At the start of 2019, Sweden is also facing a wave of bombings carried out by criminal immigrant gangs. In 2017, the Swedish police received reports of 211 explosive incidents. The figures for 2018 have yet to be released, but in Malmo alone, there were forty bomb/explosive incidents last year. In the last twenty four hours, there have already been five bombings/explosive incidents against local businesses and family homes across Sweden. A six month old baby has been kidnapped in Gothenburg, three people found dead in Sala, and one person killed and several injured in a shooting in Umea. Although the Swedish media has covered most of these incidents, the liberal media across the rest of Europe, particularly in the UK, has been strangely silent on these matters. Thanks to the efforts of ‘Peter Sweden’, a prolific vlogger, who reports on events in Sweden (and Scandinavia as a whole) in English, you can now follow these disturbing events, via his Twitter account.